The house is superbly situated on its own hill of five and three quarter acres and is surrounded by beautiful grounds. There are striking 360 degree views of the surrounding area from an elevation of 200 feet. There are views of the sea, the forest and the internationally acclaimed golf course. On the western side of the house is a hard tennis court with a covered area for spectators. Little Hill has solid mahogany doors and floors throughout and is the perfect house for entertaining with seating for twenty-four on a hundred foot long terrace and because of its elevated position, it enjoys gentle breezes throughout the year. The house is extremely well furnished and has particularly fine linens and china. There are four double bedrooms with bathrooms as well as good cupboard space and safes in all of the bedrooms. The master bedroom and bathroom is wheelchair friendly. There are fans in all of the rooms as well as new air-conditioning units. Each bedroom has a flat screen television and there is wi-fi with internet throughout the house. The villa is entered through double mahogany doors to a two level entrance hall with a fine eighteenth century cut stone floor and stone staircase leading to the main areas of the villa. The focal point is the cathedral ceilinged living room furnished in blue and white leading to the bar and card room, all with beautiful parquet floors. On the west side of the villa there is a covered terrace 100 feet long which affords one of the main sitting areas outside the bar and card room. On the east side of the villa, the long covered terrace provides a number of seating areas and is a popular area for entertaining around the pool. 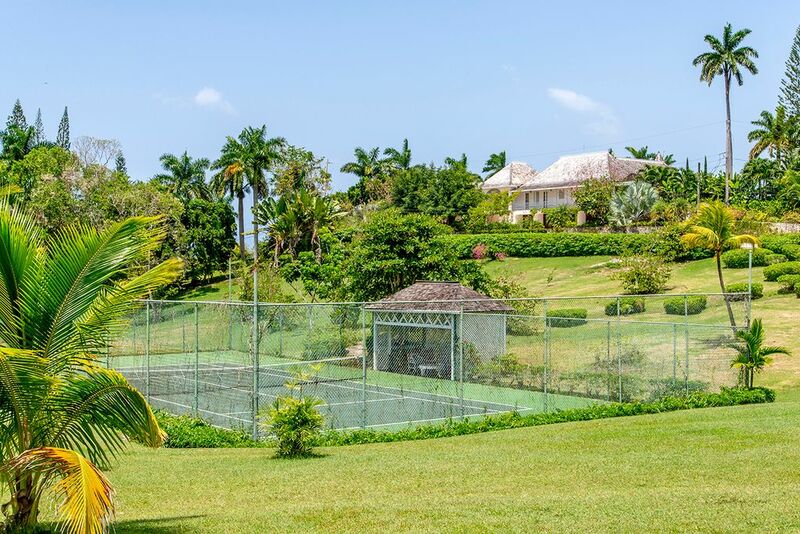 There is also a powder room, flower room and music centre in this area.Little Hill provides three complimentary golf carts for use while at the Tryall Club. The house employs a wonderful chef who can cater for any taste or diet. There is also a butler, two maids, a laundress and three gardeners.